【LATEST ANDROID 7.1 OS & SOFTWARE】: Android 7.1 OS raises the bar in performance and usability with a slick lag-free interface, compatibility with the latest android applications such as youtube,Netflix and many games, and support for more USB devices. 【TRUE 4K RESOLUTION AND H.265 VP9 DECODING】: It is really an extreme experience when watching movies with a 4K resolution, as well as playing games. Not a single detail will be missing. Powerful H.265 decoding loads pictures by taking half time and half occupation of bandwidth of H.264 decoding, it is much more efficient and faster than the old tv box with only H.264 decoding. 【POWERFUL EQUIPMENT】: It's New Android processor Quad-Core CPU, Amlogic S905X, Cortex A53 equipment , Penta-Core GPU frequency up to 2.0 GHz, makes sure the box running stable and smooth to load movies, pictures and games without buffer, no need to wait for wonderful moments. 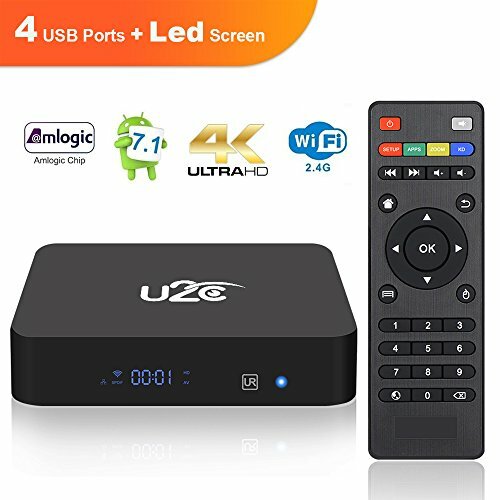 【ENHANCED ANDROID TV EXPERIENCE】: 2GB DDR3 RAM provides plentiful room to quickly start your apps and games with expandable SD storage up to 128GB, it also greatly improves the reliability of your TV box and prevents crashes due to lack of memory. 【Best Guarantee】TV BOX have Worry -free 12moth warranty and friendly customer service. Anytime you have question during usage, please contact us, our technical team provide you professional problem-address solutions. If you have any questions about this product by KUD, contact us by completing and submitting the form below. If you are looking for a specif part number, please include it with your message.